There are a lot of different aspects to Poker. There is the player side, where you focus on how to play, strategy, bluffing, the amount of chips to put on the table, and learning how to read other players antics. There is the dealer side with proper distribution of cards and knowing the ins and out of the game. Lastly, there is the bankroll side where you need to understand how multiple bankrolls fit into poker and how to manage them. 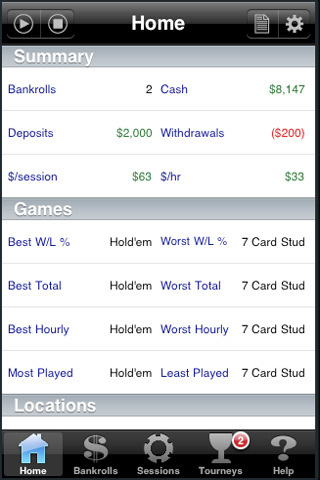 The Poker Diary iPhone app is the perfect way to keep track of all that and help enhance your poker playing experience. With the Poker Diary you can keep track of a variety of different bankrolls and how they associate to the tournaments. Hold cash games, and multiple transaction order right from this poker app. You can also get immediate feedback on the status and statistics of either a single bankroll, or for multiple bankrolls all at the same time. There are also other customization features that allow you to edit and personalize all of your poker tournament parameters. The Poker Diary app is a good poker companion to take care of the nitty gritty stuff that nobody wants to have to calculate. It is great idea to just create an app that can do it for you and still keep track of the game. If you play a lot of poker and want a good system of keeping track of statistics then you have come to the right place. Voted 4 stars by iPhone poker app users and can currently be downloaded for $2.99.